Maria offers the unique experience of personal coaching and consulting for practitioners who are ready to take their education and experience to the next level. 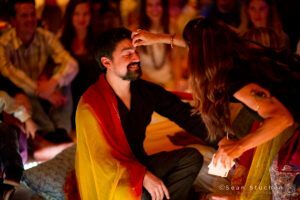 These advanced training programs will focus on health and healing through Vedic wisdom in a very unique coaching experience. These trainings were designed based on Maria’s decades of personal practice and mentoring of yoga therapists. The essence of these ancient teachings comes to life for each individual in her or his personal and professional development. Each student is given yogic and spiritual programs to foster confidence as a yoga therapy practitioner and to deepen his or her personal practice. Applicants must have a regular yoga practice (with a minimum of one year experience) and a deep passion for living their dharma. Stepping into accomplishment will require self discipline, moderation of sleep and diet, and a deep desire to help others. Applicants should already possess formal yoga teacher training or be certified yoga therapists, or involved in another helping field with a strong desire to create an integrative bridge.